Six months ago, RFK assassination expert Lisa Pease — known to ProgressiveHistorians readers as Real History Lisa — released, for the first time online, the complete text of her two-part article “Sirhan and the RFK Assassination”. (The two parts can be found here and here.) 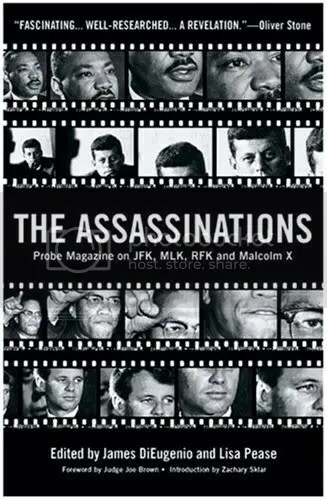 The article forms part of a book co-authored by Pease, The Assassinations: Probe Magazine on JFK, MLK, RFK, and Malcolm X” ($18.00 at Amazon).nbsp; Below, I’ll present my impressions of the article, with one significant caveat: I am no expert on the RFK assassination; in fact, I know virtually nothing about the event other than what I have read in this article.. Therefore, my reactions are entirely based upon the evidence presented in the article, and my evaluation of that evidence as presented by Pease. Sirhan was not mentally aware and not responsible for his actions when he fired at Kennedy. Pease also expends a significant portion of the second article building a case against another potential shooter/accomplice, Shirin Khan, daughter of an Iranian crook; while the case makes at least some sense, Pease acknowledges that Khan is merely “a plausible name,” and as such her positive identification or lack thereof is not central to the article’s argument. (The floating of a plausible alternative to Sirhan was, however, central to Sirhan’s court defense, with which Pease was working at the time the article was written.) It’s worth noting that every one of these arguments flies directly in the face of the accepted wisdom on the assassination, and that proving any one of the four should shock the historical community to its core. In my judgment — again, only reading the evidence presented in the article — Pease has pretty conclusively proved two of the four arguments, has presented circumstantial evidence in favor of a third, and has presented a fairly specious argument for the fourth. The bullet that pierced Kennedy’s coat without entering him took a path of roughly 80 degrees upwards. The bullet was moving upwards in a back to front path (as were all of Kennedy’s wound paths). But the LAPD figures this must be the bullet that hit Paul Schrade. Had Schrade been facing Kennedy, he would still not be tall enough to receive a bullet near the top of his head from that angle. But he was not standing in front of Kennedy. He was behind him by all eyewitness accounts, and as shown by the relative positions where the two fell after being hit. For Sirhan alone to have made all the shots, we are asked to believe that one of the bullets that entered Kennedy’s coat just below the armpit exited up and out of the coat just below the seam on top of his shoulders, and then pulled a U-turn in midair to hit Schrade in the head. Schrade has been one of the most persistent in calling for a new investigation of this case for precisely this reason. He knows the report is incorrect, and if it’s incorrect, there had to be at least one more gun firing in the pantry. Evidence of additional bullets surfaced nearly immediately. On June 5, an AP photo was published showing two police officers pointing at something in the center frame of the swinging doors that led into the pantry. The caption read, “Bullet found near Kennedy shooting scene”. In 1975, Vincent Bugliosi, who was then working with Schrade to get the case reopened, tracked down the two police officers depicted in the photograph. To that time their identity had been unknown. Bugliosi identified the two officers as Sgt. Charles Wright and Sgt. Robert Rozzi. Both Wright and Rozzi were sure that what they observed was not only a bullet hole, but a hole containing a bullet. If the hole contained a bullet, then it would have been the ninth bullet, since seven bullets had been recovered from victim wounds and the eighth was to have disappeared into the ceiling (necessary to account for acknowledged holes in the ceiling tiles). This evidence, plus evidence of several other bullet holes and eyewitness statements that multiple guns were fired, indicates that there was clearly more than one gun fired in the room — a direct contradiction to the “official” story. Of course, the security guards or Secret Service agents in the room could have fired the extra bullets in an attempt to hit Sirhan, or perhaps simply as a reflex action amid the confusion. However, the mere fact that the evidence clearly (at least according to Pease’s reporting) shows a different number of bullets in the room from what the police allowed, and that multiple eyewitnesses report accomplices for Sirhan who were never officially acknowledged by the police, is huge. It indicates that the book on the RFK assassination is far from closed, and that the police on the case were either criminally negligent or, as the conspiracy theorists would have it, covering up something they would rather not have the general public learn. Most CIA doctors and hypnotists will claim that they never found success, that they could never program someone to do something against their will. Not true, argue others. On the latter point, the simple way to get someone to do something against their will is to alter their reality. Well, actually, it is true, as any reputable psychologist or psychotherapist will tell you — including my own father, who studied hypnotherapy under Milton Erickson. Such an argument is clearly inadmissable in court, and should not be contained in a scholarly work. Despite what I deem her failing to conclusively prove the third precept listed above and a more serious lack of evidence for the fourth, Pease’s article is of critical importance and ought to be read by every twentieth-century American scholar. The strong, almost insurmountable evidence buttressing her first two arguments leads to a larger and, I think, underlying problem with the whole case. The fact that the murder of such a prominent figure as Robert Kennedy could have resulted in such an obviously inept, if not corrupt and secretive, investigation raises serious questions about what exactly the LAPD and federal investigators thought they were doing in 1968. Such a high-profile case should be so thoroughly investigated, its depths so fully plumbed, that only wild-eyed loonies could doubt the concluding report. The fact that Pease is clearly not such an individual is itself evidence of the travesty that was committed through this criminally-bungled investigation. The fact that, in light of this evidence, the federal government has still not released all the relevant documents on the case, or conducted a thorough and complete reexamination of the case is absolutely unbelievable. Perhaps Pease’s evidence is faulty, or her conclusions are questionable. But the American people want answers and truth, not obfuscation by their government and condescending brushoffs from their most prominent scholars. It is not for Pease’s sake that this case needs to be reinvestigated by skilled and open-minded individuals, but for the generation of Americans who were inspired by the man who asked, “Why not?” and who had their hero cruelly ripped from them in his prime. When the people demand the truth, scholars should give it to them. Lisa Pease is to be commended for demonstrating so thoroughly this need with regard to the RFK case; let us hope that her fellow scholars, including those with academic doctorates, will follow her lead in answering the questions that have remained open for too long. This entry was posted on Saturday, October 6th, 2007 at 8:38 pm and is filed under Uncategorized. You can follow any responses to this entry through the RSS 2.0 feed. Responses are currently closed, but you can trackback from your own site.